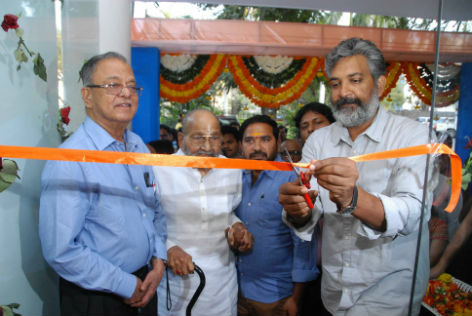 SS Rajamouli and K. Vishwanath launched the school formally by cutting the ribbon and lighting the lamp. 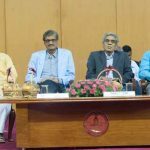 Addressing the gathering later SS Rajamouli, the Bahubali fame Director lauded the role played by Prasad Film Laboratories in the success of the films made in the last fifty years. Prasad Film Labs contributed or rendered service in one way or the other in contributing to the success of those films he said and added that the Lab is always ahead of the rest in introducing the latest technology and sighted an examples when Bahubali was made, he(Rajamouli) looked for some technology, which Prasad Film Labs didn’t have it. But. Ramesh Prasad, made it a point that they imported the machinery withing twon months and rendered service to the Bahubali movie. Addressing the gathering the septuagenarian actor said that everybody think that if lot of funds are made available all of us can movies like Bahubali. But, in make case, I cant even make one frame, he told the 200 plus gathering that graced the inaugural function. Speaking on the occasion Ramesh Prasad, recalled the contribution his father made to the film industry. Ramesh Prasada lauded Rajamouli and his family. The entire family works for the film industry like Raj Kapoor family, he told the gathering. The New School conceived and launched on the occasion of 110th Birth Anniversary of Sri L.V. Prasad to mark and celebrate the same. The school is launched to offer some of the best and contemporary educational programs. The courses will be contemporary in tune with the ongoing technological changes such as Digitization, Digital Film Restoration, Digital Archiving, Digital Asset Management, and Visual Effects happening at a rapid phase. To mark and celebrate the 110 the Birth Anniversary of Sri L. V. Prasad, a specially made 20 minute film on Sri L.V. Prasad was also screened. LV Prasad is known producer, director and actor. He was a doyen and recipient of the Dadasaheb Phalke Award, the highest award for film in India. He founded Prasads Group in 1956 which include the Prasad Art Pictures, Prasad Studio, Prasads IMAX and LV Prasad Eye Institute. He was the Member of the Board of Film Censors. Prasad also had the unique distinction of acting in the first talkies of three different languages of Indian cinema; Alam Ara (Hindi), Bhakta Prahlada (Telugu) and Kalidas (Tamil). It is a matter of great pride that the Prasad’s Creative Mentors Film & Media School was launched on the eve of his 110th birth anniversary. Prasad Film Laboratories is a name to reckon in the film world. It has a history spanning more than three decades. Prasad Group is a Pioneer and Leader in the Indian Media & Entertainment World. The activities of Group encompass Post Production, Exhibition and other value added services. Over the years Prasad Group has become synonymous with commitment to quality, trust and dependability. Gone are the days of Animation films which used to be made for kids. These movies are not just limited to children only but even mature audience. The best example for the latest animated movies “Avatar”, “Bahubali”, which are made on a very high budget and equipped with the latest technologies and software of animation and multimedia informed Suresh. The new trend now is to make Animation appear real. This is possible through Non-photorealistic rendering (NPR), which is an area of computer graphics that focuses on enabling a wide variety of expressive styles for digital art said Suresh Kovvuri, an Animation professional and Managing Director of Creative Mentors. The launch function was graced by many luminaries of the film world.